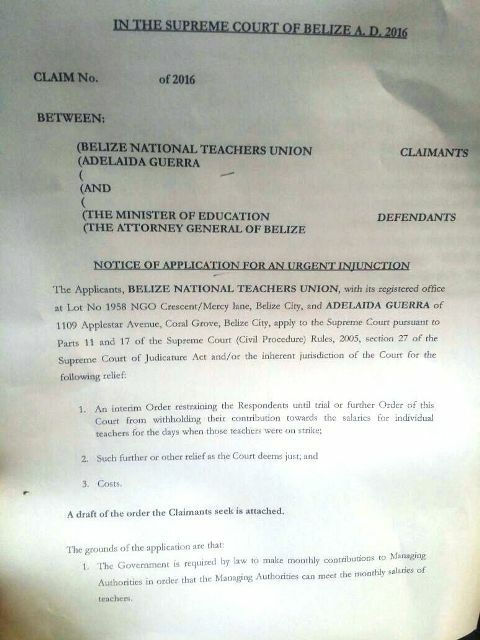 The Belize National Teachers Union is proceeding to court on the matter of the deduction in salaries of teachers who went strike for eleven days in October when the union demanded good governance by G.O.B. Government has threatened that the deductions will be reflected at the end of this month which is just weeks away from the Christmas holidays. Earlier today, attorney Eamon Courtenay, on behalf of the B.N.T.U. 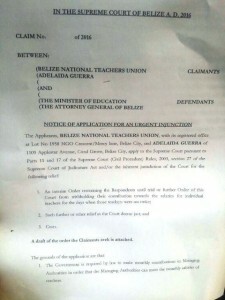 and Adelaida Guerra, filed an application for an injunction against the Minister of Education and the Attorney General. The union is seeking from the court an interim order to restrain the G.O.B. from withholding contributions. This is on the grounds that government is required, by law, to make monthly contributions to the managing authorities of schools so they can pay teachers. The union believes that the decision to dock salaries goes against the grain of the constitution and therefore null and void. B.N.T.U. is seeking an undertaking from the Government to continue to make its contributions so teachers can receive their full salaries. With the claim now filed, attorneys await a date for a hearing. Before filing the claim, the B.N.T.U. wrote the government, but there was no response forthcoming since we are told, government does not react to ultimatums.